Virtual Presentation Cards Download In the same way that people used to make their personal business cards to present themselves, you can now use virtual presentation cards. They are easy to do, and today we are going to present you one of the best sites to build your own personal cards. 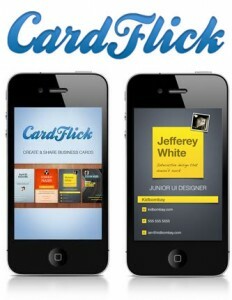 Let's talk about Cardflick ,a website that allows you to create your own "virtual" personal card . The first thing to do is to find a good image that identifies you, you can choose your own images or those you have saved in social networks like Instagram or Facebook. An interesting point is that the cards you make in Cardflick ,can be viewed on iPhone and Android. The Cardflick has a series of pretty funny templates, which will allow you to put your personal data to share on social networks or by email. Another advantage of Cardflick is that if you have the device installed on mobile phones, you can share your cards with others who also have the application installed.